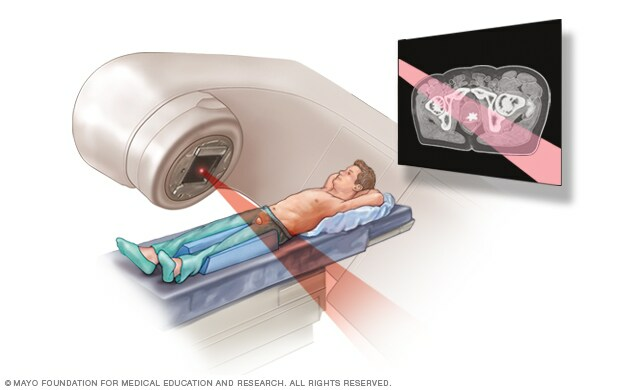 During external beam radiation treatment for prostate cancer, you lie on a table while a linear accelerator moves around you to deliver radiation from many angles. The linear accelerator delivers the precise dose of radiation planned by your treatment team. External beam radiation for prostate cancer uses high-energy beams, such as X-rays or protons, to kill cancer cells. During external beam radiation for prostate cancer, the high-energy beams are generated by a machine called a linear accelerator that aims the beams at your prostate gland. External beam radiation for prostate cancer kills cancer cells by destroying the genetic material that controls how cells grow and divide. Healthy cells in the beam's path also are affected by external beam radiation therapy, resulting in side effects. The goal of external beam radiation for prostate cancer is to destroy the cancerous cells while sparing as much of the normal surrounding tissue as possible. External beam radiation for prostate cancer is one of the standard treatment options to treat prostate cancer. It may also be used for men who have prostate cancer that comes back after surgery. The type and severity of side effects you have with external beam radiation for prostate cancer may depend on the dose and on the amount of healthy tissue that's exposed to the radiation. Most side effects are temporary, can be controlled and generally improve over time once treatment has ended. Newer technologies, such as intensity-modulated radiation therapy (IMRT) or proton beam, deliver the highest dose of radiation to the target while sparing surrounding healthy tissue. This helps minimize side effects of external beam radiation treatment. Most of the side effects are mild and tolerable. Some side effects may develop months to years later. Serious late side effects are uncommon. Ask your doctor about potential side effects, both short- and long-term, that may occur during and after your treatment. Before you undergo external beam radiation therapy for prostate cancer, your health care team guides you through a planning process to ensure that radiation reaches the precise spot in your body where it's needed. Accurate planning is essential for the use of all radiation therapy, but especially so for IMRT. The goal is to precisely deliver radiation to the cancer while minimizing damage to surrounding healthy tissue. Radiation simulation. A few days before your radiation simulation appointment, several marker seeds will be inserted into your prostate by a radiologist. These markers help to more precisely locate your prostate during each radiation treatment session. During simulation, it's crucial that you lie still during the procedure. Your radiation therapy team will help you find a comfortable position during treatment. Customized immobilization devices are used to help you hold still in the right position. Your radiation therapy team will make marks on your body to be used for setup during your radiation therapy sessions. Planning scans. Your radiation therapy team performs computerized tomography (CT) scans to determine the exact area of your body to be treated. After the planning process, your radiation therapy team decides what type of radiation and what dose you'll receive based on your stage of cancer, your general health and the goals for your treatment. External beam radiation for prostate cancer is conducted using a linear accelerator — a machine that directs high-energy beams of radiation into your body. As you lie on a table, the linear accelerator moves around you to deliver radiation from many angles. The linear accelerator delivers the precise dose of radiation planned by your treatment team. Each treatment session usually lasts less than an hour. Most of that is preparation time. The actual radiation treatment only takes a few minutes. You lie down in the position determined during your radiation simulation session. You might be positioned with customized immobilization devices to hold you in the same position for each therapy session. The linear accelerator machine may rotate around your body to deliver radiation beams from different directions. You lie still and breathe normally during the treatment. Your radiation therapy team stays nearby in a room with video and audio connections so that you can talk to each other. You shouldn't feel any pain. Speak up if you feel uncomfortable. After your external beam radiation therapy is complete, you will have regular follow-up appointments with your doctor to evaluate how your cancer has responded to the treatment. You will need long-term monitoring to determine whether your disease is in remission or if additional treatment is needed. External beam therapy (EBT). Radiological Society of North America. http://www.radiologyinfo.org/en/info.cfm?pg=ebt. Accessed Apr. 1, 2016. DiBiase SJ, et al. External beam radiation therapy for localized prostate cancer. http://www.uptodate.com/home/. Accessed April 1, 2016. Wein AJ, et al., eds. Radiation therapy for prostate cancer. In: Campbell-Walsh Urology. 11th ed. Philadelphia, Pa.: Elsevier; 2016. http://www.clinicalkey.com. Accessed Jan. 3, 2016. Prostate cancer. American Cancer Society. http://www.cancer.org/cancer/prostatecancer/detailedguide/prostate-cancer-treating-radiation-therapy. Accessed April 1, 2016. McAninch JW, et al., eds. Radiotherapy of urologic tumors. In: Smith and Tanagho's General Urology. 18th ed. New York, N.Y.: The McGraw-Hill Companies; 2013. http://accessmedicine.com. Accessed April 1, 2016.